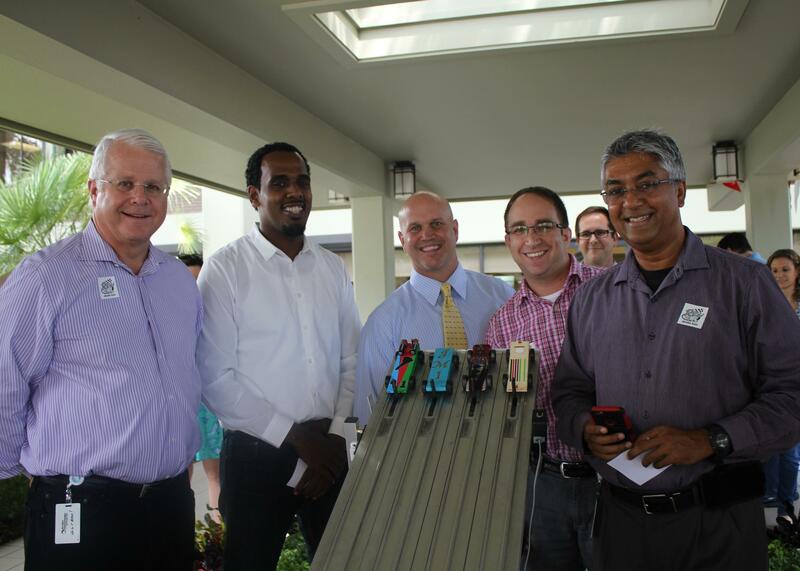 JM Family President & CEO Colin Brown (l) with finalists in the company’s first ever Pinewood Derby Car Championship, benefiting United Way. The living wage movement went mainstream in 2015. Just ask the Floridian Of The Year. Last year started with Wal-Mart, responding to nationwide protests, announcing that it was immediately raising its minimum wage to $9 an hour, with $10 planned for February 2016. Big deal, said the movement’s activists. They had already shifted their focus to local and state governments. They demanded that the minimum wage be raised to a “living wage” of $15 an hour—with a union. As the year wore on, the Fight for $15 movement took off faster than even its organizers had hoped. By the end of the year, activists were busy in 270 cities. All three Democratic presidential candidates voiced their support. Fourteen city, county, and state governments approved $15 minimum wage laws, with notable victories in New York, Massachusetts, New York City, Los Angeles, Pittsburgh, Chicago, San Francisco, Rochester, Buffalo, Seattle, Milwaukee, and Santa Fe, according to a tally kept by the National Employment Law Project (NEPL). While $15 makes an easy-to-understand political goal, the actual wage needed to lead a dignified life depends on where you live and who lives with you. FIguring all that out is the goal of the Living Wage Calculator, which is maintained by Amy K. Glasmeier at the Massachusetts Institute of Technology. Glasmeier’s team scored a big victory in late 2014, when IKEA announced it would use the MIT site to gradually adjust its starting wages up to a living wage, with an initial hike to $12 an hour. A year later, IKEA reported that the decision had been good for the company, and expanded it to include operations in the United Kingdom. But the movement’s biggest win might have come in December, when the mainstream business magazine Florida Trend named its “Floridian of the Year.” Colin Brown, CEO of JM Family Enterprises, got the honor for quietly implementing a $16 hourly minimum wage for his company’s 4,100 employees. The amazing thing was how normal it all seemed. Brown, a 66-year-old lawyer educated at a military academy and Duke University, runs a franchised Toyota distributorship in southeast Florida. He is on the board of directors for his local United Way, a business roundtable, and a statewide good government association. He loves the Pinewood Derby. The Fight for $15 has 16 more legislative or ballot proposals pending in another 15 jurisdictions this year, according to the NEPL. And with friends like Colin Brown, the sky’s the limit.